Muller Honda of Gurnee is your dedicated source for the very latest Honda automobile models available, including the new Honda CR-V, Accord and Odyssey. No matter your family size and lifestyle, there is a new Honda waiting for you at our full-service Honda dealership. Take to the streets of Gurnee in a sleek new Honda Civic in sedan, hatchback or coupe form; or, treat your growing family to the refined ride of the new Pilot SUV. Our helpful Honda sales staff is here to assist in your new Honda search, so stop by for a tour and test drive! If you are in search of a like-new vehicle at a great price, turn to our fully-stocked used car inventory. We only sell pristine pre-owned vehicles that meet our quality standards, so do not hesitate to shop and compare our selection of used and Certified Pre-Owned Honda models. We offer late-model used cars, SUVs and pickups from a range of automakers on our used car lot to help ensure drivers find the ideal vehicle at the right price. Contact us about your trade-in vehicle and the type and price of pre-owned car you are after to trade up to a pre-owned Honda. As a full-service Honda dealer, we cater our financing packages to car buyers of all credit scores and financial backgrounds. Let our finance specialists negotiate competitive terms on behalf of your healthy credit score; or, talk to us about your sub-prime credit situation and let us work to find a financing solution. College students and first-time buyers who have not established credit are also encouraged to apply for loans and receive financing assistance from our team. Use our online auto loan application to express interest in financing a new or used Honda CR-V or Odyssey. If you are the type of Honda driver that enjoys tinkering with your Civic on the weekends or prefer to do your Accord's oil changes at home, Muller Honda of Gurnee is here for you with genuine Honda parts. When you utilize authentic factory Honda components and accessories from our in-house parts department, you can help ensure that your at-home auto maintenance is completed the right way, and that you protect the resale value and factory warranty of your Honda. Shop for genuine Honda accessories online now with our parts request form. Periodic visits to our Honda service center will help ensure that your Honda remains in top form while cruising around Crystal Lake, Waukegan and beyond. With Honda factory-trained technicians on staff and genuine Honda components and fluids in use, your Honda can remain 100% Honda and receive the proper maintenance it deserves. Treat your Honda SUV to a quick and quality oil and filter change today; you can book your upcoming service visit via our online service scheduler. See our service specials to save money on your next maintenance appointment! You don't need to be in the immediate Gurnee, IL area to take advantage of the many automotive services available at Muller Honda of Gurnee. 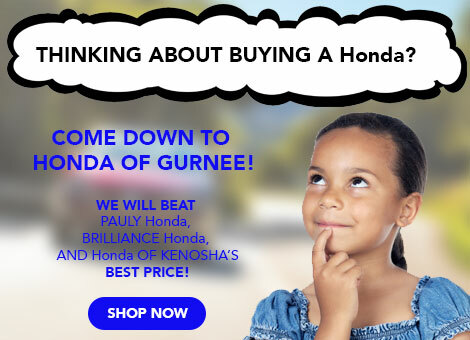 Here on our interactive website, you can shop our new car specials, view current Honda lease and finance offers and learn about your car's trade-in value -- all from the comfort of your Waukegan home! We are your trusted source for all things Honda and automotive, where you can enjoy a stress-free shopping experience. Contact us today and shop our website before your visit.